An ergonomic case study was completed for a client in the Cosmetic Industry in their Order Entry & Fulfillment Department to determine the productivity gain they might see if they implemented ergonomics equipment and ergonomic training in this department for their employees. Each order entry clerk would manually enter in handwritten orders coming in from their sales representatives into the system so the orders could be fulfilled and shipped out to the customers. The department was able to capture the number of keystrokes electronically, and could therefore determine the number of keystrokes each agent could type per minute, and how long it took them to process an order. The study began by looking at their historical data (shown below). 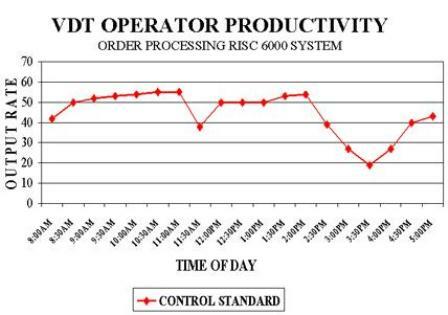 The overall average of orders processed per order entry clerk was about 46 every half hour. 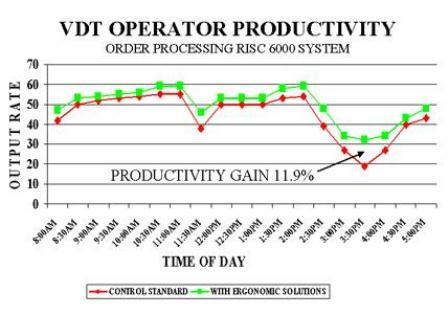 They noticed that right before lunch the numbers of orders processed dropped, as well as noticed that after lunch the number of orders steadily increased until about mid-day and then numbers of order processed decreased significantly until their break. The increase in productivity after the break was not as high as after their lunch break either. How could they improve these numbers? A height adjustable desk and an ergonomic chair were then installed for each order entry clerk. Once the workers were comfortable using their new equipment, their keystrokes were measured again (data shown below). The entire productivity curve went up, but they still had drop off periods throughout the same periods every day, although the afternoon drop off had improved. The productivity gain in the afternoons (ie: # of orders processed) after ergonomic equipment was installed was 11.9% higher than before. Progress, right? But, what else could they do to improve these numbers? The employees were then given an Ergonomics 101 training class which helped them understand what ergonomics was, how it relates to them, how to use their ergonomic equipment correctly, and how working in healthy postures can benefit them in the long run. Once the order entry clerks learned about ergonomics and went back to work for a few days incorporating their new working postures and habits, the study then continued, and their keystrokes and orders processed were reassessed. Results showed that the entire productivity curve went up another level which meant that the order entry clerks were keying at faster rate and that more orders were being processed during each 30 minute interval. 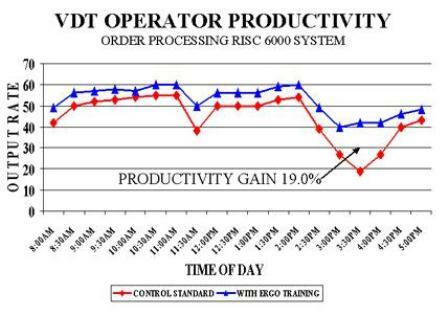 Due to the fact that the overall productivity curve increased across the board, the drop offs were not as significant before lunch or afternoon breaks as they were initially, or even after ergonomic equipment was installed, but were highest after ergonomic training was included. The most significant part of the study was that there was a 19% gain in productivity in the afternoons after ergonomic equipment was installed and ergonomic training had been completed.